1 Commercial Real Estate & Properties in Allawah are listed in 1 categories. We have 1 Development LandsSale . Raw Development Site Contact George on 0417458..
Two weatherboard houses are being offered in one line as a raw unit development site with potential for a five storey boutique apartment building (STCA). 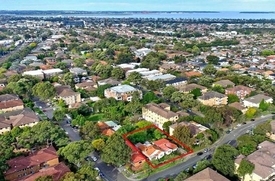 The two properties have a total area of 964sqm approx and a total frontage of 24.38m approx. walk to Westfields Hurstville. Only 15km to Sydney CBD.